Another wine-related post? Well, it is that time of year! 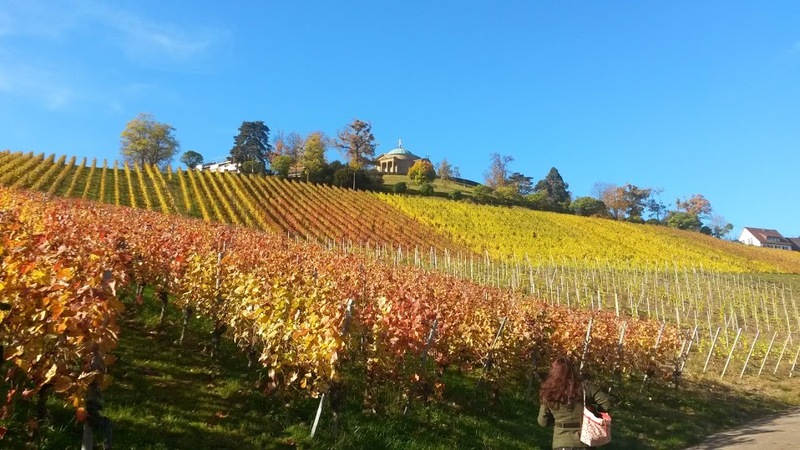 And instead of my typical boring post just telling you what something is, I'm going to give you actual, practical advice you can use for one of the most popular events in the Stuttgart region: The Esslingen Wine Walk. For those who aren't familiar, however, the wine walk (or weinwanderweg in German) is an event where the local winemakers set up booths in the vineyards where the grapes are grown, over a course of several miles. For a refundable fee, you are given an adorably tiny wine glass (complete with cord to hang it around your neck!) and let loose to hike from station to station, sampling wines as you go. At the end of the route, there is a huge fest with a traditional band, wurst, and even more wine. Sounds great, right? It is - but a lot of first (or let's be honest, second or third!) timers make some basic mistakes, and end up in rough shape afterwards. So I'm going to give you some important tips to making sure you have a great time. Choose the right outfit. Spring weather in Stuttgart is notoriously changeable, as you can see from the picture above, and we all know how accurate the forecast is here! Dressing in layers is a must. And tick season is in full effect, meaning pants are your best option. This is a hike, so forget the cute shoes and wear something sensible. WEAR SUNSCREEN. Then bring more with you. I'm serious about this! Also bring water, and buy more along the way. Dehydration isn't fun for anyone. Try to stick to one taste per station. The tasting size may seem small by local standards, but think of it this way - if you have one glass per station, you'll have drank nearly a full bottle of wine by the end of the hike, and you want to be in good shape for bench dancing at the party after! Some people decide to buy bottles along the hike, which can save time standing in line, but can also lead to drinking too much, too fast. It's best to go this route only if you're with a large group of friends. Take public transit. The wine walk is considerably less fun for a designated driver, and it's hard to tell just how much you're drinking along the way, so avoid any chance of a DUI. The hike starts and ends within a 10 minute walk of the S-bahn line. Eat! I can't stress this one enough. Start with a big breakfast or lunch, and get a snack at one of the booths along the way. Avoid shortcuts. Sure, it might be tempting to walk down the hillside through the vineyards, or even down one of those ancient narrow staircases, but given all the rain recently, the steep ground is likely to be slick, and after a few glasses your coordination may not be the best. Just stick to the path! Don't forget to get your stamps! If you have one taste at every station, you are entitled to a free tasting at the fest at the end. 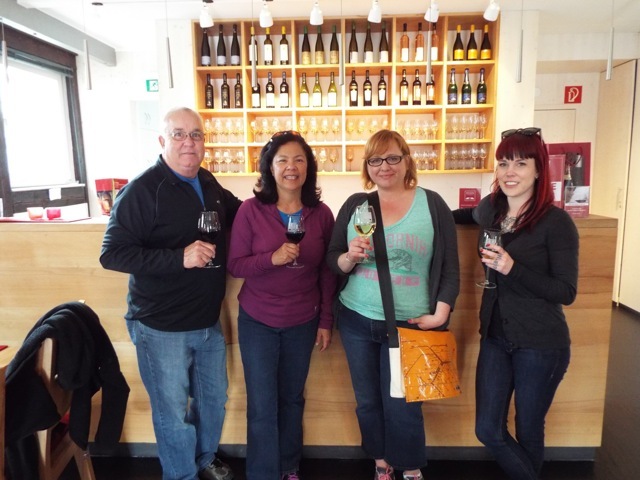 Take my brand-new Esslingen walking tour before the wine hike! We'll start at 10:00 a.m., and finish at the starting point by 11:30 - perfect timing! You'll learn about the origins of one of Germany's oldest cities, why Esslingen was bigger and more important that Stuttgart for nearly 1,000 years, and all about the local wine culture. Impress the new friends you meet on the weinwanderweg with this trivia! Did I mention that this tour is 2 euros off the regular price per person? What a deal! That about sums it up! If you'd like a little more information on why Esslingen was so important, read about Free Imperial Cities in this previous blog post. Hope to see you either at my tour or up in the vineyards on Sunday, May 18th! One of the things I absolutely love most about Germany is the focus on being outdoors. The minute the weather is decent (which for Germans seems to be anytime the thermometer tops 50 degrees Fahrenheit!) you will see locals sitting outside at cafes, spilling out into the many squares, and of course, hiking! Ready for some walking and some wine! Germans do take hiking seriously, but that doesn't mean they aren't into having fun while doing so. Seems at the top of nearly every hill is a biergarten or restaurant just waiting to satiate your hunger and thirst. It's a great motivator! We start in the suburb of Oberturkheim, which is an easy, 10-minute ride on the S-bahn from the Stuttgart main train station. We meet right outside the station at 12:10 p.m. From there, we walk just a few blocks to the restaurant of the Winery Zaiss. This restaurant, the "Sonnenbesen", is not only a great place to get a viertel of their excellent wine, but also has some of the best Swabian food in the whole area at very reasonable prices. Thus fortified, we begin our climb - just about 15 minutes uphill, past the beautiful 15th-century church, up into the vineyards. From there, we'll descend through fruit orchards in full bloom to the charming village of Ulbach, which has been a center of wine production for over 500 years, and is home to some of the region's most prestigious wineries. Here we'll either stop for a private tasting, or enjoy a glass of local wine on the leafy patio of a local restaurant, and take a brief tour of the Weinbau wine museum, with ancient presses. Then it's time to climb uphill again, as we skirt up the vineyard-covered sides of the Rotenberg mountain (more of a big hill, really!) This used to be the site of the Wurttemberg's ancestral castle, before it was destroyed in a war in the 1300's forcing the Wurttembergs to relocate to what is now downtown Stuttgart's Alte Schloss. At the top of the hill today is the Grabkapelle, a beautiful mausoleum created by King Wilhelm I as tribute to his beloved wife Queen Katharina, who died tragically young. Admission to the Grabkapelle is included in the tour price. After enjoying both the views and this moving tribute to eternal love, we'll start our descent to our next stop, a lovely outdoor besen for a glass overlooking the Neckar valley. It's all downhill from there! We'll finish at the Unterturkheim train station sometime between 5:00-6:00 p.m., where we'll hop back on the S-bahn towards the Stuttgart Hauptbahnhof. I've personally done this hike four times in three different seasons, but in my opinion, Spring is when the scenery is at its best! So grab your hiking shoes and make a reservation! Space is limited on a first-come, first-serve basis. All the details can be found here. Hope to see you on Sunday!